Early on Christmas morning when we were looking out the windows and watching birds, Chris commented that she thought we would have a special visitor today; just a feeling. 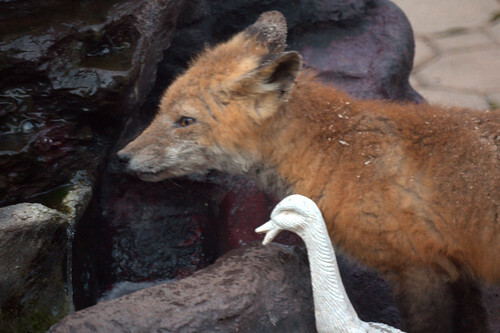 While visiting on the phone with one of our daughters and taking the turkey out of the oven, Chris practically had a fit when she saw the fox, who has been around the neighborhood a lot, drinking out of our waterfall. We sort of suspected something larger than the birds had been helping themselves to some sips, because we've had to fill it up with bucketfuls. 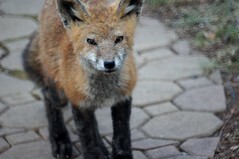 This fox was not at all startled when Mike went out to get its picture. It even gave a little shake like a dog would to get some water off its face. Nice to know we are helping out the wildlife with our heated waterfall while the lake is not available for them. 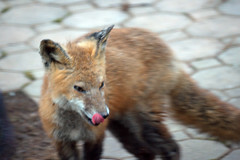 Wow, that's amazing that a wild fox lives around your home. Great photos.